Searching for smart ways to get people talking about your business? Are you looking for creative ways to market your products and services? � Boost responses to your sales letters, direct mail packages, email, and ads. 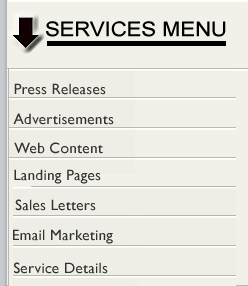 � Punch up your press materials so they stand out and funnel attention to your business. � Add more sizzle�to your websites, landing pages, banners, flyers and postcards. Don't be a needle in a haystack. Stand out from the competition? I can make it happen. My marketing and copywriting services can give your business powerful options to boost sales, expand membership or increase your internet traffick.